Google Addiction: Will Google Purchases be a Download? 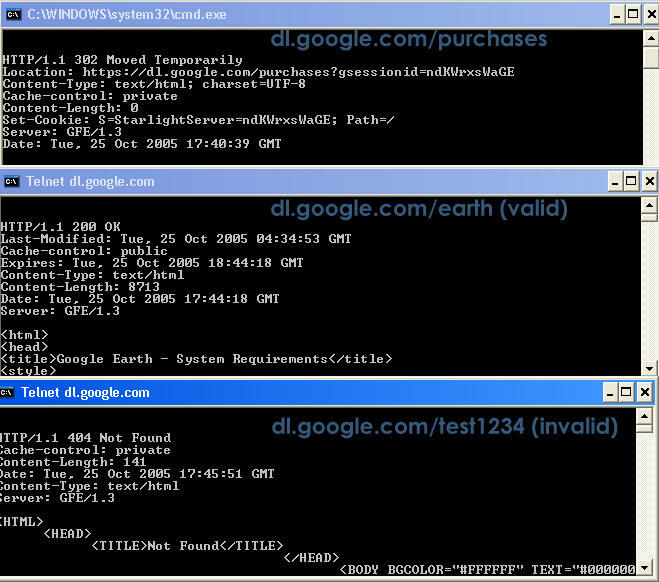 Since Google Earth has now started to be available for users choosing to "Check for Updates", I have been poking around the dl.google.com domain using telnet to view headers and I have found something quite interesting. I was testing subdomains and this is a screenshot of what I think I have discovered. 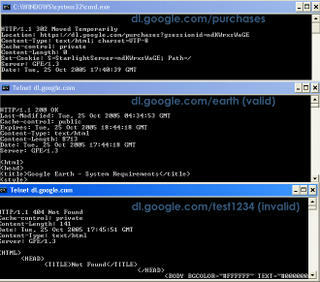 Basically what it looks like is Google Purchases will have some sort of downloadable component to it. The headers are a bit "off" for the sub directory "/purchases". It mentions something about "Starlight Server", and that it "Moved Temporarily". This is strange because when you try and visit a subdirectory that doesnt exist at all (test1234) the message is quite different. What could Purchases possibly need a physical application for? Maybe Google will allow people to store sensitive information on their own computers to counter the privacy concerns that surround information such as credit card numbers and bank accounts. Does anybody have ideas as to what this download might be? Maybe they just had a download location for some of their employees or partners to get at the code. Might not have ever been intended for public.